Chapter: 5 Organizing Meeting and Conference. Meeting Meetings are unpopular because they take up time, usually that of many people. However, there are. 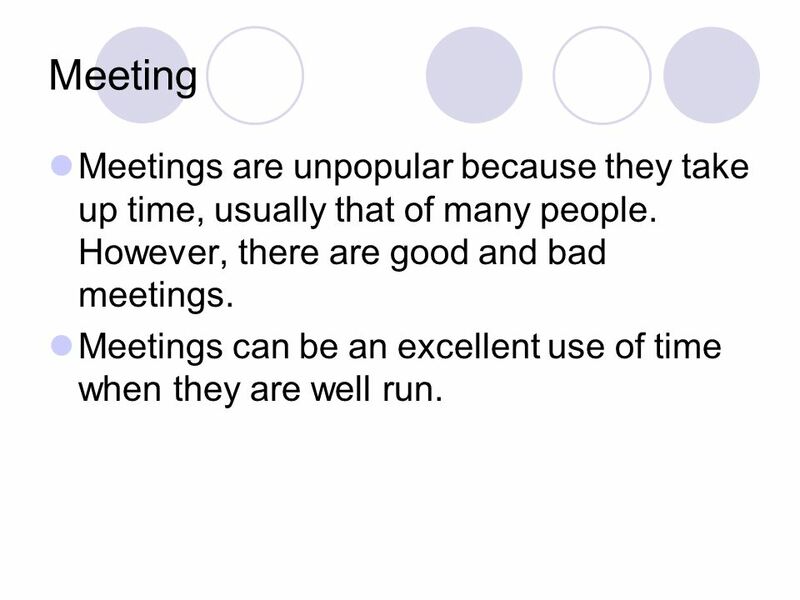 2 Meeting Meetings are unpopular because they take up time, usually that of many people. However, there are good and bad meetings. Meetings can be an excellent use of time when they are well run. 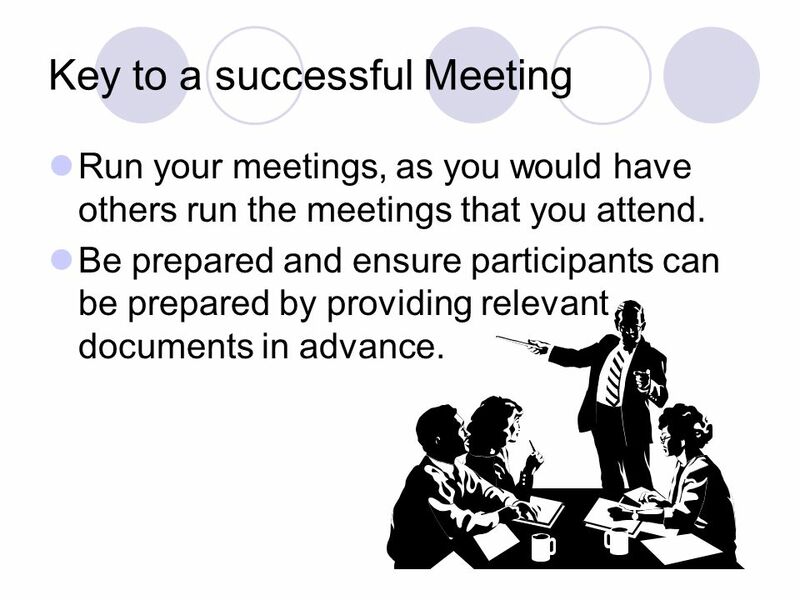 3 Key to a successful Meeting Run your meetings, as you would have others run the meetings that you attend. 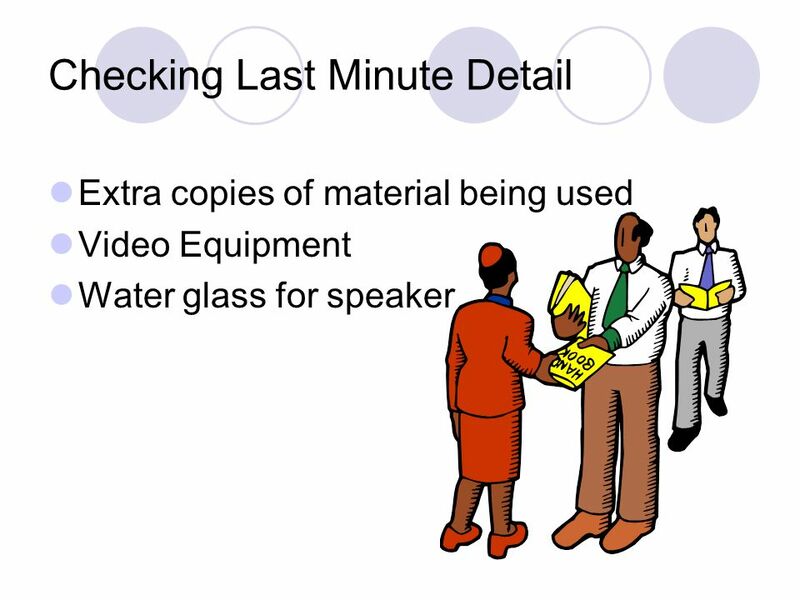 Be prepared and ensure participants can be prepared by providing relevant documents in advance. 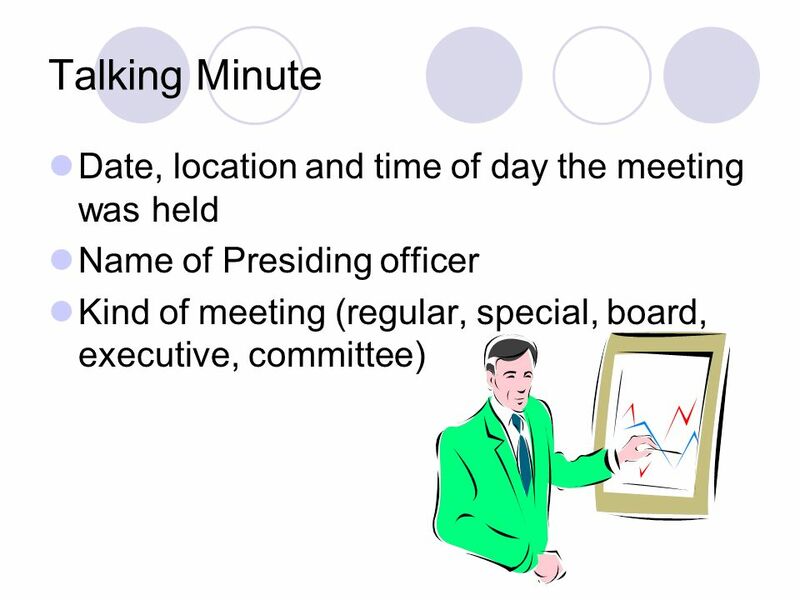 4 Key to a successful Meeting Start the meeting on time and end it on time (or even early). Stay on topic. 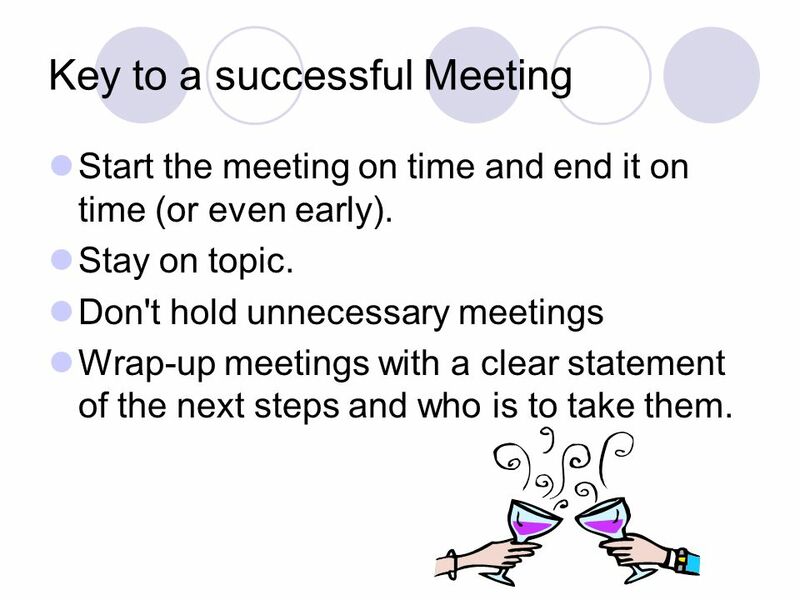 Don't hold unnecessary meetings Wrap-up meetings with a clear statement of the next steps and who is to take them. 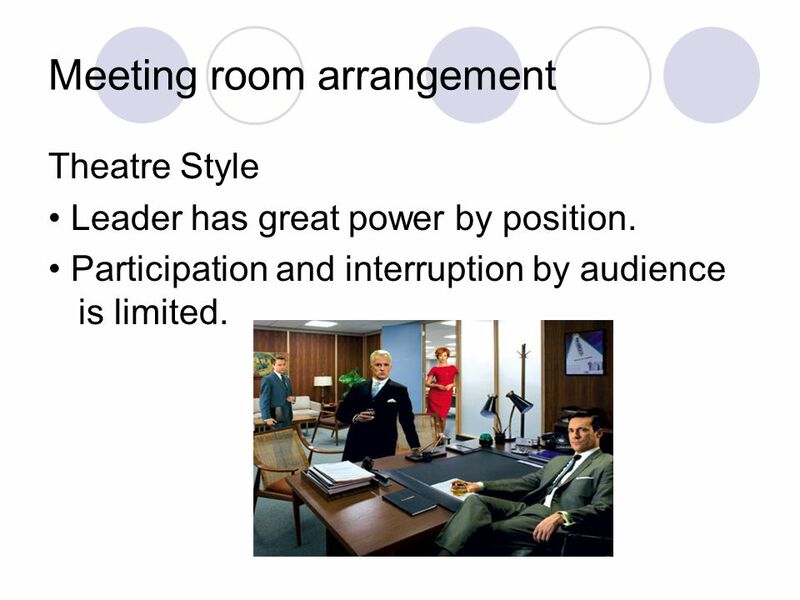 5 Meeting room arrangement Theatre Style Leader has great power by position. Participation and interruption by audience is limited. 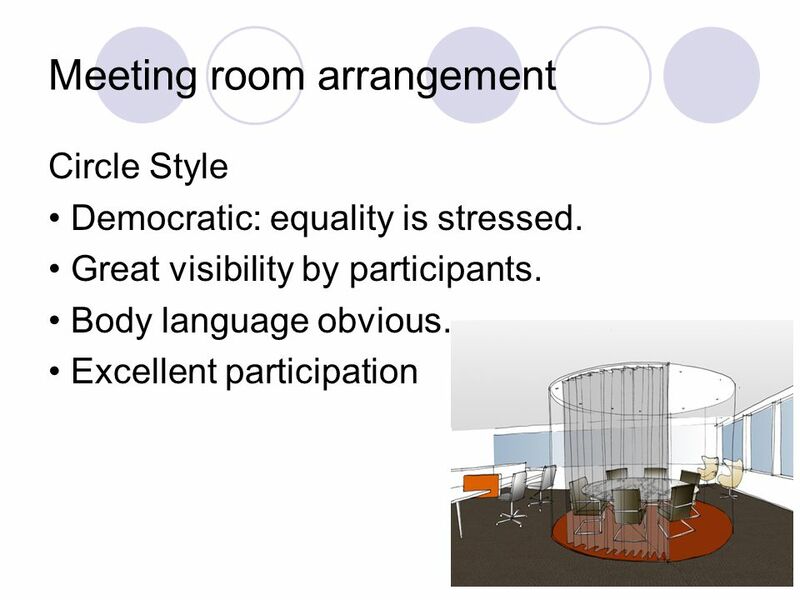 6 Meeting room arrangement U-Shaped Style Equality of membership. No doubt who is the leader. Good visibility for visual aids. 11 Meeting Preparation During the meeting Greet visitors Take minutes and provide special assistance when needed. 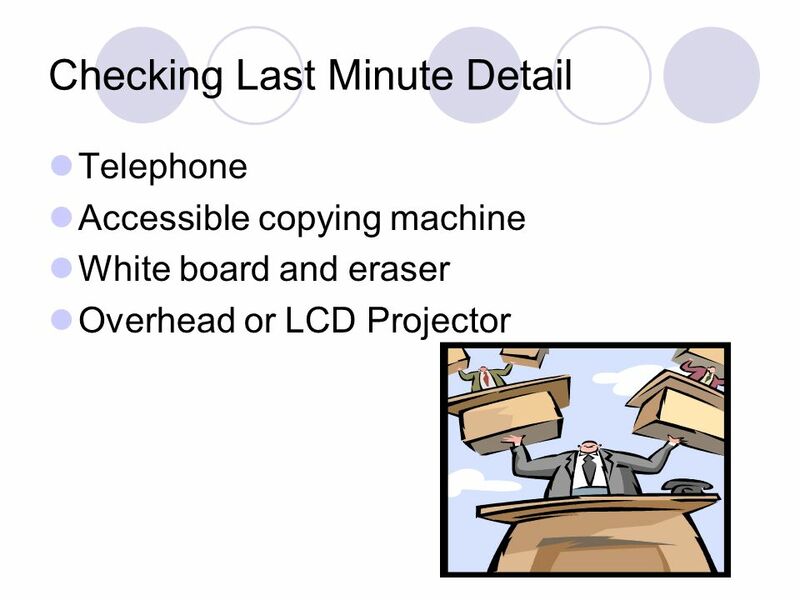 14 After the meeting Prepare minutes Note any problems for future reference File minutes and other materials. Draft acknowledgments and letters of appreciation. 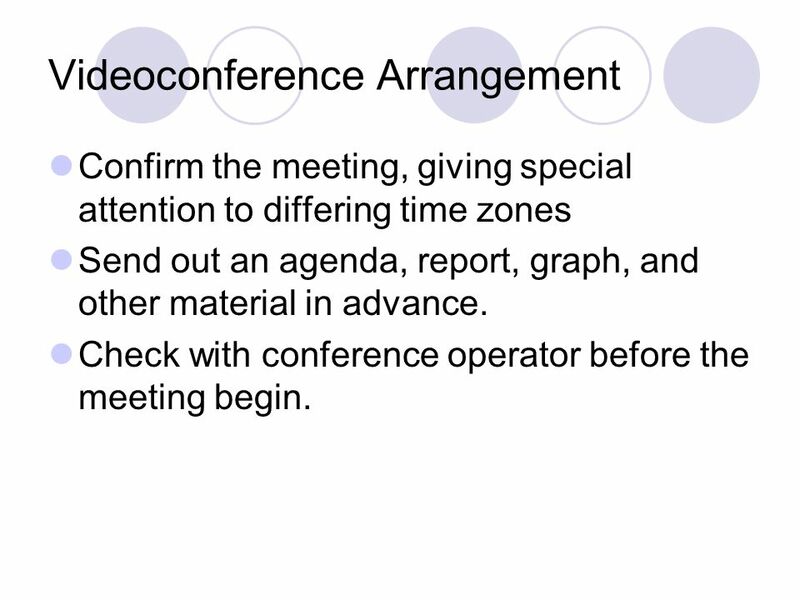 16 Videoconference Arrangement Confirm the meeting, giving special attention to differing time zones Send out an agenda, report, graph, and other material in advance. Check with conference operator before the meeting begin. 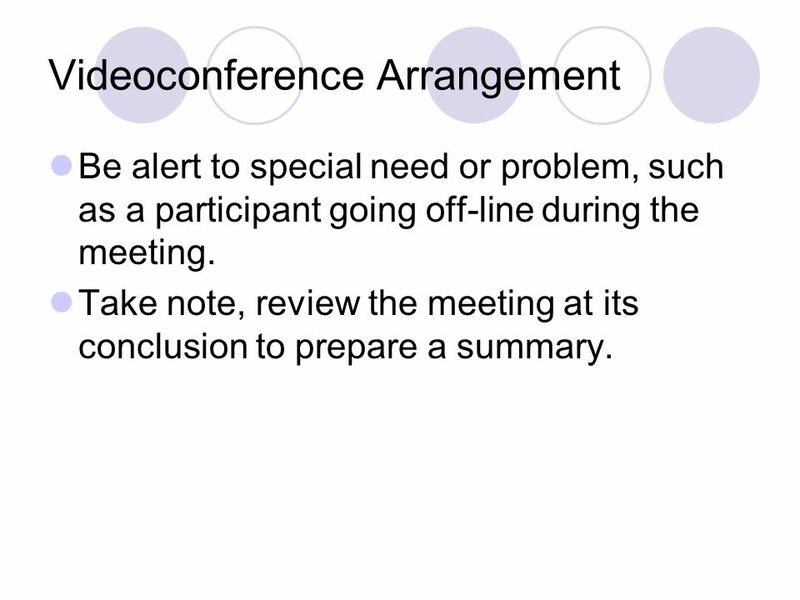 17 Videoconference Arrangement Be alert to special need or problem, such as a participant going off-line during the meeting. Take note, review the meeting at its conclusion to prepare a summary. 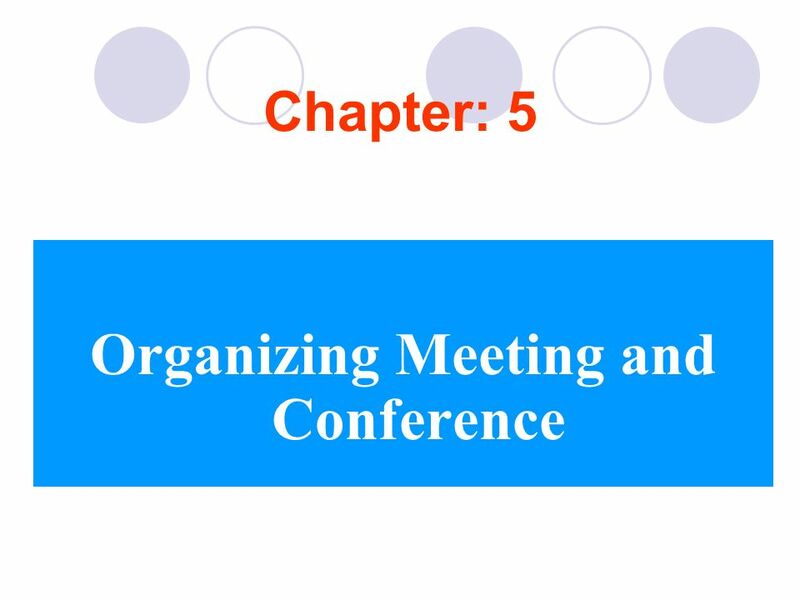 Download ppt "Chapter: 5 Organizing Meeting and Conference. Meeting Meetings are unpopular because they take up time, usually that of many people. However, there are." CPS ® and CAP ® Examination Review OFFICE ADMINISRATION, Fifth Edition By Schroeder and Graf ©2005 Pearson Education, Inc. Pearson Prentice Hall Upper. 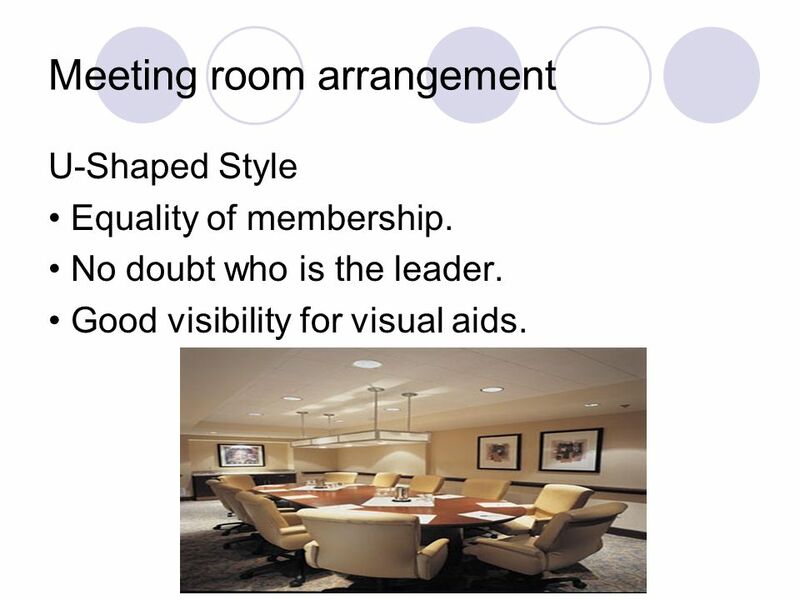 How to Conduct a Great Meeting. Set Objectives Provide an agenda beforehand Assign meeting preparations Assign action items Examine your meeting process. Ensuring that building products meet code requirements ICC Evaluation Service, Inc. The ICC-ES Evaluation Committee conducts open public hearings on proposed. Zonta International District 9 Leadership Training Secretary. Organising seminars and conferences. 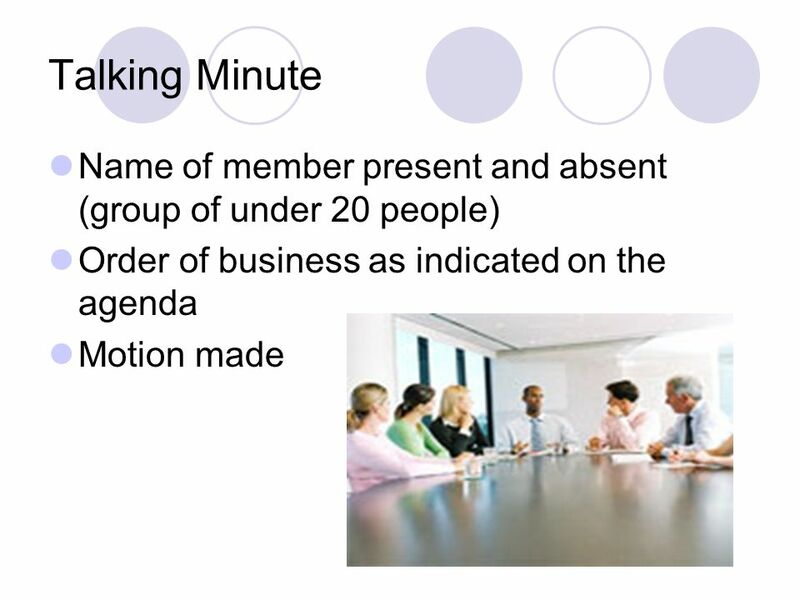 Types of meetings 1. Organization meetings (board of directors’ meet, youth clubs). 2. Planning meetings (village. 5/10/2015Secretary1 Squadron Secretary. 5/10/2015Secretary2 Squadron Secretary “It’s in the book” CPS-ECP Guidebook. Irwin/McGraw-Hill 16-1 Chapter 16 Planning and Running Effective Meetings. 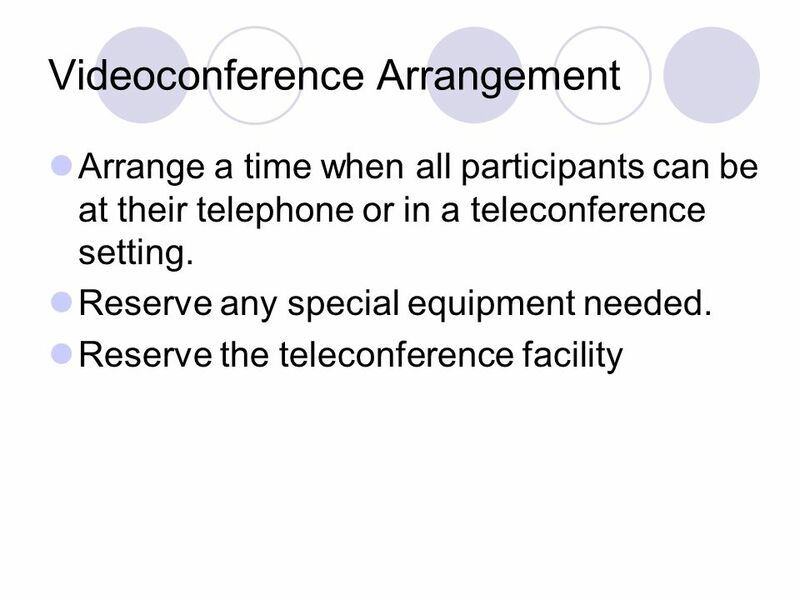 AVIT Video Conferencing Training Module Lectures. District Team Training Seminar Roles and Responsibilities of Assistant Governors. Briefing on Taiwan: Project Instructions By Doris L. W. Chang 2002/12/26.